Who can resist freshly fried dough that’s covered with colorful sugar frosting? Unfortunately, doughnuts are not the most common breakfast items found in Korea. However, a small number of quality doughnut shops are there to fulfill our cravings for everyone’s favorite sweet breakfast choice, late-night treat, or a random mid-day snack. 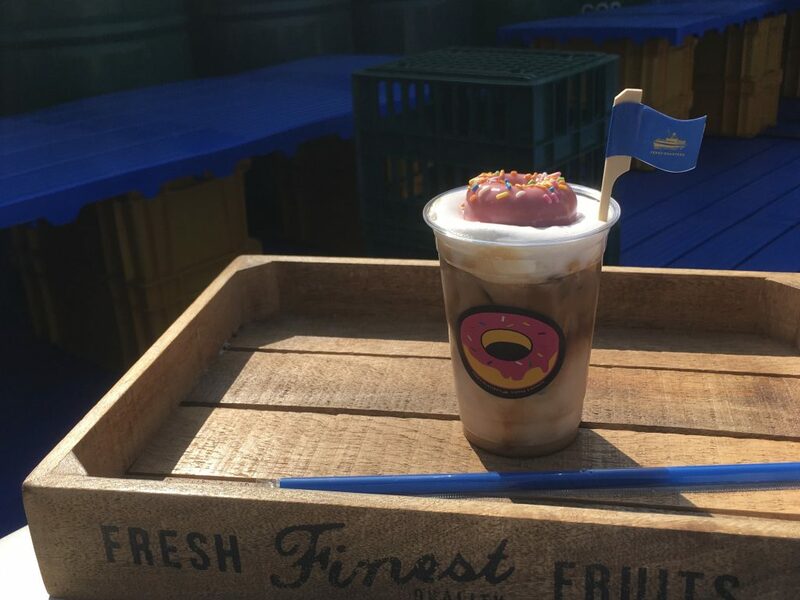 Originally renowned for its much grammable “donut float latte,” Ferry Roasters launched a cafe specialized in doughnuts last year. Located in the quiet back alley of Hannam-dong, the stylish doughnut shop is always packed with people – and dogs, as this dog-friendly cafe is visited by many dogstargrammers. What Old Ferry offers is not one of those conventional doughnuts. Instead, you can find large fried dough bombs filled with cream or jam. The cafe is also enthusiastic about creative flavors. Their dessert-inspired doughnuts, which include tiramisu and crème brulee, are must-try. Fluffy Doughnut is Yeonnam-dong’s new hottest cafe. The doughnut shop, which opened only about a month ago, is already visited by hundreds of people every day. Fluffy Doughnut’s fried delicacies are characterized as conventional doughnuts with creative twists. Flavors like Mango Glazed & Caramel or Vanilla Glazed & Orange Jam make doughnuts more like delicate desserts by using unexpected flavor combinations. 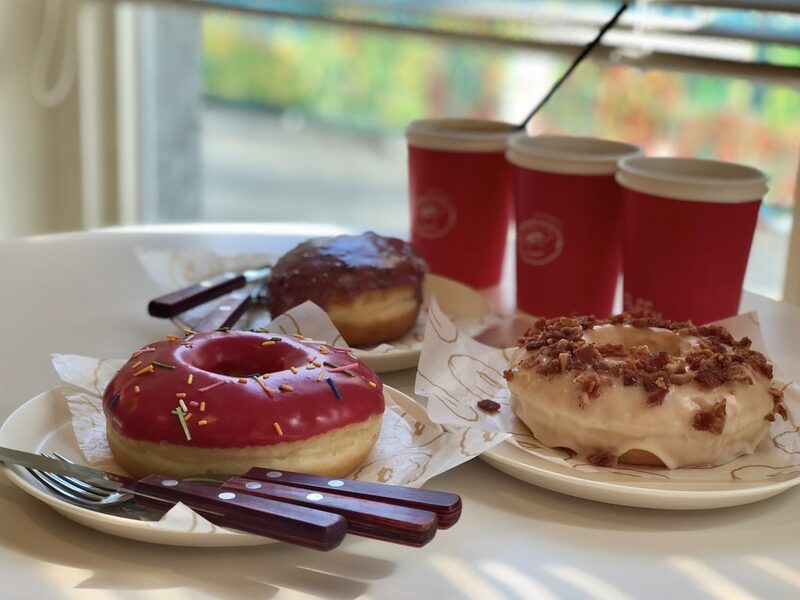 The raspberry-flavored “Simpsons” doughnuts and Maple Bacon doughnuts are some of the customers’ favorites. If you’re attracted to the famed “Mr. Holmes” style doughnuts rather than colorfully glazed doughnuts, Cafe Knotted has something like that. The whole variety of cream-filled and sugar-coated doughnuts are available at this cafe in Cheongdam-dong. Flavors range from the predictable ones like Vanilla and Nutella to the more creative ones like Tiramisu, Pistachio Fig, or Red Bean Butter. The available flavor options look various enough to satisfy any palate. Noe Bakery in Haeundae, Busan, is known to make healthy and delicious baked doughnuts. The showcase is filled with baked dough coated with colorful frostings. Noe Bakery’s doughnuts tend to reflect trends well. 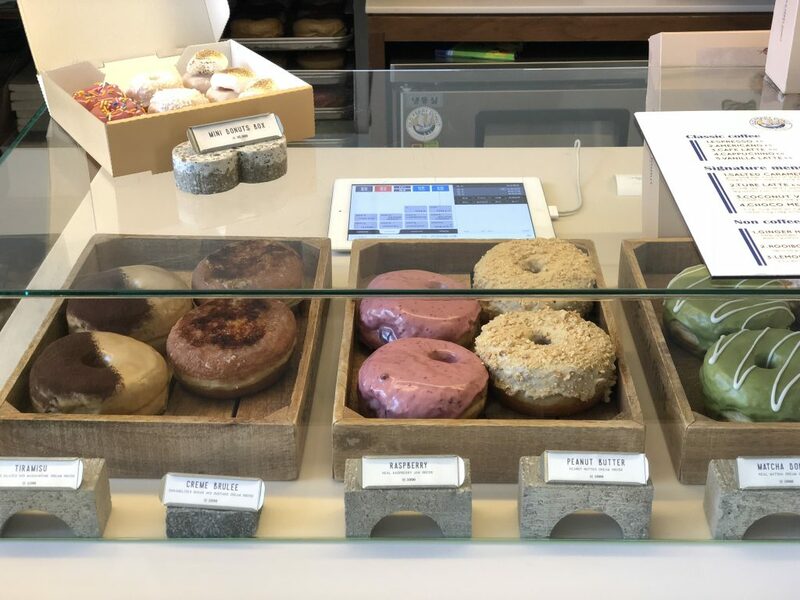 The stellar “Galaxy” doughnuts and cream cheese topped red velvet doughnuts, as well as some seasonal flavors, are all available at Noe Bakery.